The LTD 400 Series is designed with the professional performing and recording musician in mind, but is available at a price that even casual players can afford. 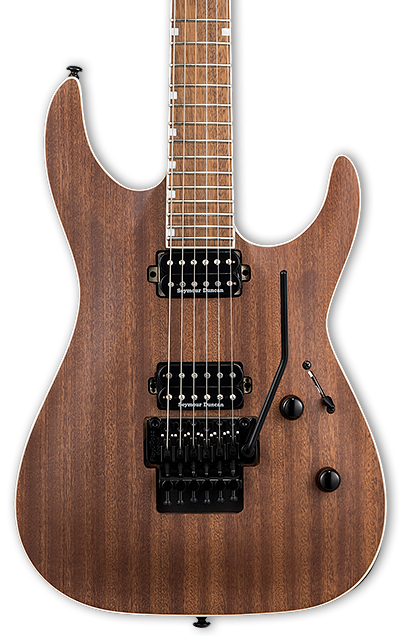 With the MH-400NT M, you get the great look of the arched-top MH Series with neck-thru-body construction for terrific sustain. This guitar has a great-looking mahogany top in Natural Satin finish, with the warmth of the wood contrasting perfectly with its black hardware. Its mahogany body and fast three-piece maple neck are constructed at 25.5" scale, with 24 extra-jumbo frets on its pau ferro fingerboard. Two high-quality Seymour Duncan pickups are direct-mounted to the body, with other components including Grover tuners and a TOM bridge with string-thru-body for added sustain.